Swan Island's attraction is the unique combination of wildlife, recreation, and history. Located only 20 minutes south of the capitol city of Augusta, it is a quaint agricultural landscape where time seems to stand still. Large forested areas dotted with open fields and small wetlands attract plentiful wildlife. We hope you will come and enjoy the island through one of the many nature seeking activities that we encourage. To plan your visit checkout the season and fees, or call (207) 547-5322. The only thing better than a day on Swan island is camping overnight. 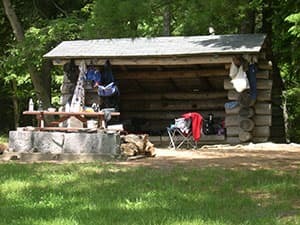 Each of the island's 10 campsites has a fireplace next to a three-sided lean-to, or Adirondack Shelter, which sleeps up to six. The lean-to's are open to the air; so many visitors choose to pitch a tent in the vicinity of their shelter. Drinking water and restroom facilities for campers are also available at the campground. Campsites are spread out for privacy and sit at the edge of a grassy field overlooking Little Swan island and the Kennebec River. All Camping is by reservation only (See Season & Fees). Come relax and enjoy the night life on Swan Island. Swan Island is well known for a variety of wildlife. The island, Little Swan Island, and surrounding tidal flats are a Wildlife Management Area. This means the primary purpose of the area is to conserve and manage the land for wildlife habitat while allowing recreational use of the area. Situated at the head of Merrymeeting Bay the island has historically been a stronghold for Bald Eagles. It was instrumental in recovery of the species. Today there are three nesting pairs that call the island home. Hundreds of acres of old fields are maintained and managed for a variety of bird species. These grasslands also benefit many of the forest dwelling animals and birds as well. 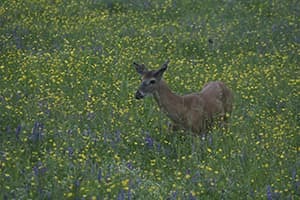 The variety of woods and fields including old apple orchards are used by the many whitetail deer roaming the island. Once extirpated from Maine, wild turkeys are now abundant and have returned to Swan Island as well. The island's shoreline and mudflats are a key component of Merrymeeting Bay's estuarine landscape that help sustain countless waterfowl, wading-birds, shorebirds, and water dependent animals. Shortnose sturgeon are often seen leaping high in the water over the Kennebec River and countless other fish swim quietly beneath the surface. Come observe and be delighted by the scenic beauty of Swan Island. Enjoy the abundant fishing opportunities Swan Island has to offer. Trout Pond has bass and stocked brook trout for children 15 years of age and under. Best of all, the fishing gear is provided! Merrymeeting Bay is fed by six rivers making the bay an exciting fishing destination, but you'll need your own fishing gear for the river. Time your trip with the Striped Bass run or try your luck catching smallmouth bass, carp, trout or salmon. Be sure to check the fishing regulations first. Swan Island is a small island with a large history. In centuries past, Abenaki Indians had a summer hunting camp here. While some claim the island was named by English explorers for migrating swans, others believe the name is short for 'Swango,' the Abanaki word for 'island of eagles.' Evolving into an active farming community during the 1800's, about 100 people in 20 homes lived and worked here. 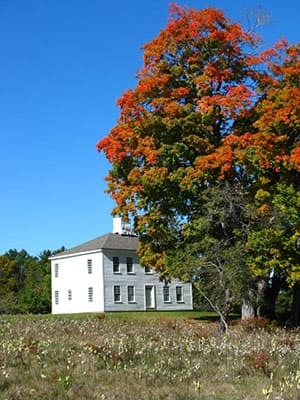 Five historic homes still stand today. The island is listed in the National Register of Historic Places. The Maine Department of Inland Fisheries and Wildlife (MDIFW) began acquiring island properties in the 1940's. By 1988, it became the Steve Powell Wildlife Management Area in its entirety. Stephen Powell was the island's first biologist and resided on the island for many years. He carried out numerous game management and research activities in cooperation with others. Swan Island truly is "the island forgotten in time". FOSI coordinates the fundraising, grant writing and volunteer efforts that are needed to restore and maintain the historical structures on the island.